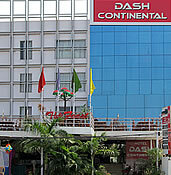 A well-established budget hotel, Dash Continental is located very close to the Vadodara Airport and near the Vadodara Railway Station. We offer all modern amenities: All rooms air-conditioned; 27 Rooms; 24-hour room service; Laundry service; Free airport pick-up service; Fax machine and computer on request; Baggage storage on request; Multicuisine restaurant/cafe. We offer quick online hotel booking. Phone: +91-265-3952555, +91-265-2488248. Fax: +91-265-2482249.